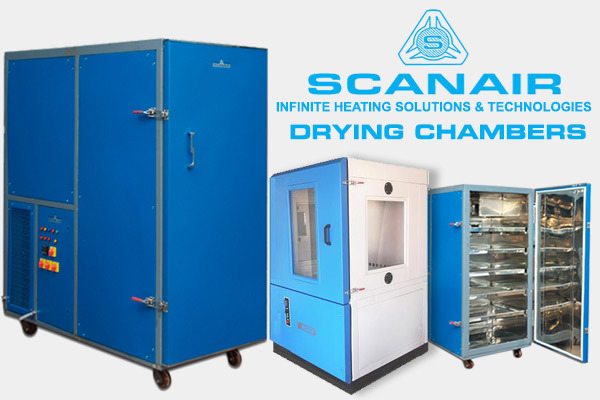 Scanair industrial dryers strongly committed to quality, our range of products are fabricated in the way of walk in Drying Chamber / Drying room / Drying Equipment according to customers requirements, Elevated Temperature / Cold room with humidity control, heated room with steamer control etc. Chamber with Hot / Cold / Dry / Wet with full digital control features. One of the most efficient and controllable ways of drying moisture materials is by using a heat pump drying. For years heat pumps have been known as an efficient method of energy recovery. Heat pump for drying is difference, of the hot heat produced by condenser and cold heat by the evaporator will be use currently during the operation. The heat from the condenser will produced hot and will use to heat the material and the cold heat from the evaporator will be use in dehumidifying process. Their ability to convert the latent heat of vapour condensation into the sensible heat of an air stream passing through the condenser makes them attractive in drying applications especially when combined with the ability to produced well-controlled drying conditions in the drying room. Crop drying is the process of removing water from food by circulating hot dry air through it. Hot air is required to vaporize the moisture contained by the solid, and air flow is necessary to remove the vapor. For effective drying, air should be hot and dry and moving and moisture must migrate from within the product to the product’s surface, as this is where the moisture exchange with the air occurs. There are two stages in a typical drying process the first stage is the removal of surface moisture the second stage is the removal of ‘internal moisture’ from within the solid material. The drying process is therefore divided into a “constant rate’’ period and a “falling rate’’ period. During the constant rate drying period, the surface of the material is still wet and the rate of drying is governed by evaporation of free moisture from the product’s surface or near surface areas. The rate of drying is dependent on the vapour pressure difference between the surface and the air. Drying air temperature, air velocity and shape and size of the drying materials can significantly affect the drying rate. As drying progresses, the product’s surface is no longer wet, but dry portions of the solid jut out into the drying air film. The drying rate falls and moisture must move from the product’s interior to the surface before it is in this period that the crop usually achieves its final desired moisture content that is safe for storage. Drying in this period is strongly dependent upon the drying air temperature. The industrial sector is of course a large energy consumer. 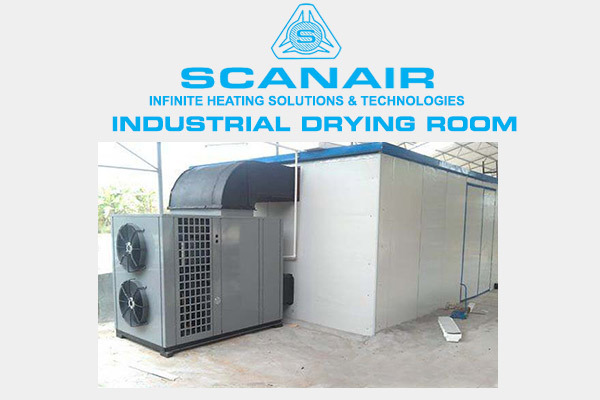 Since good design is essential for the long-term reputation of the technology, Scanair India addresses ourselves as installers, manufacturers and consulting engineers for Drying Chambers. We designed a custom built system for low temperature drying to increase output in the two main stages of crouton production. 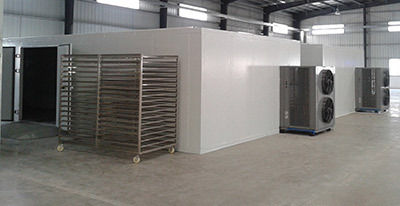 One step in the process requires a room to be kept cooler than the ambient and another stage requires the product to be dried at temperatures higher than commercial dehumidifiers can achieve that met the customer’s needs and important increases in production were achieved with no other capital investment, space or manpower. Our custom-developed drying rooms or chambers ensure consistency and quality. Our solutions resulted in product consistency, production efficiency and reduced waste. All of this contributed to the continued growth of the company and its profits. Drying chambers are loaded with product usually on trolleys or racks in the chamber after doors closed, cycle started. Can be automatic programmed cycle or simple on/off initial heat input to get to operating temperature, typically 40-55˚C but may be up to 70˚C. Heat encourages moisture to evaporate from product, by increasing internal vapour pressure. Air flow over the product takes moisture away from surface taking it to the dehumidifying coil, which may be assisted by blowers positioned in the section. Evaporator extracts moisture from proportion of air flow that passes through the unit. 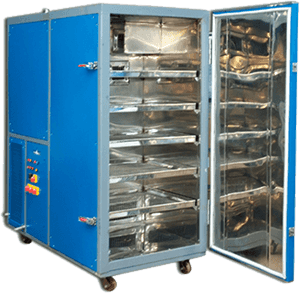 Latent heat is returned back into the drying chamber reducing the requirement for heat input the lower vapour pressure of the dried air increase the rate of evaporation. 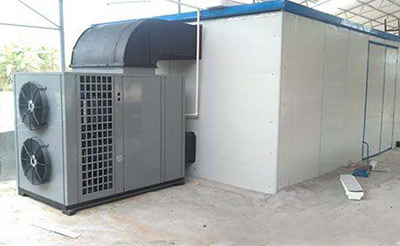 Peanut seed drying chambers provided by the heat pipe technology is an efficient process that enabled Scanair Air to air heat pumps to supply max air temperature of 80’C, as well as environment-friendly, energy-saving product developed specifically for the drying industry. An intelligent equipment integrated de-humidification, heating, cooling moisture, discharge and ventilation using the closed type de-humidification and heat pump drying method, results in energy-saving and emission-reduction with closed type drying, each drying room reduces coal combustion of above 80kg every day thus significantly reduces detrimental effects on seed’s physiological quality. Our drying chambers uses the principle of heat pump with heat recovery from vapor condensation and no waste heat emission, saves energy costs over 30% more than in intensive drying rooms and over 60% more than in vertical type drying rooms. Using closed type drying, no contact with external air, good drying quality, high yield, good color and luster and high grade of peanut, ginger, turmeric products, improves price for them. The control of both humidity and temperature allows a drying cycle to be created that is tailored to a particular product. Temperature is controlled by activating either the heat pump or exhaust fan, whilst the humidity is controlled by activating the dehumidifier. On an automatic cycle it is possible to delay the start of the de-humidification until the product has been heated up initially. Provide stepped increases in temperature during the cycle to assist in getting the last few per cent of moisture out of the product. Progressively reduce the humidity to provide a gentle drying regime for sensitive products. In special cases like drying timber humidity has to be increased during the heat-up phase at the start of the cycle otherwise splitting and cracking, or warping of the timber is possible as the timber starts drying too rapidly. High temperature heat pump drying equipment is mainly applied for fruit, vegetable, medicinal material of tobacco, seafood, pet food, flowers, wood processing, corn, tobacco seeds, pumpkin, spinach, onions, bracken, wild vegetable, carrot, celery, tomato, pepper, cowpea, mushrooms, edible fungus, garlic, ginger, dried apples, dried fish, rose petals, drying modulation and food processing etc..